TREM proteins are cell surface receptors involved in innate immunity and the inflammatory response. TREM-1 stands for triggering receptor expressed on myeloid cells 1. It belongs to the v-type immunoglobulin superfamily, and is considered to be an orphan immunoreceptor because its ligand has not yet been identified. The TREM-1 receptor is expressed on monocytes, macrophages, and neutrophils. While the full mechanism of TREM-1 action has not yet been elucidated, it is known to function as an amplifier of the host inflammatory response. It has been shown to act synergistically with pattern recognition receptors, such as the NOD-like receptor (NLR) and Toll-like receptor (TLR) families, leading to the release of pro-inflammatory cytokines. It has also been associated with the signal transduction molecule DAP12. Expression of TREM-1 is upregulated after exposure to LPS and other microbial products, and as a result it is found at higher levels in areas of bacterial and fungal invasion. In clinical studies, soluble TREM-1 has been detected at high concentrations in blood and lung fluid samples from infected patients, indicating its potential use as a direct marker for infection. Bio-Rad manufactures several antibodies specific to human and mouse TREM-1. Anti-human TREM-1 (MCA4697, clone TREM-37) is available in a purified format for Western blotting, and flow cytometry. This clone is available in convenient 25 ug/25 test size. 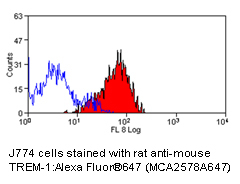 Anti-mouse TREM-1 (MCA2578, clone L5-B8.2A12.3A12) has been conjugated to the traditional flow cytometry label FITC, and to high performance Alexa Fluor® 488 and Alexa Fluor® 647. This clone can also be obtained in a purified format in 0.1 mg and 0.25 mg sizes. Bouchon, A., et al. (2000) Cutting edge: inflammatory responses can be triggered by TREM-1, a novel receptor expressed on neutrophils and monocytes. Bouchon, A., et al. (2001) TREM-1 amplifies inflammation and is a crucial mediator of septic shock. Klesney-Tait, J., et al. (2006) The TREM receptor family and signal integration.